I believe all painters have miniatures/models lying around that their makers aren’t too proud about. Whether they are the painter’s early work or just somehow botched up, these otherwise perfectly decent toy soldiers remain largely unused because of their looks. Before my big love affair with painting/modelling I used to think of my miniatures as mere gaming tokens. With that philosophy in mind I had been working on an SS-company and had them built and painted to a mid-point. It was about that time when I realized that I really don’t want to spend numerous hours painting tokens but really wanted to up my work to something I felt was a better standard. I decided to trash the project and start fresh. For a couple of years I just couldn’t shake the nagging feeling of guilt about dumping a whole semi-ready Flames of War army. Finally I decided to dig them out of their dust-covered storage box and try and finish them to an acceptable standard. Objective of the Salvage Mission: To paint the already once dumped SS-company to a decent gaming standard. The aim is not to make a showcase army, but rather something robust yet nice enough for regular games and maybe friendly local tournaments as well. The first unit to dig out were the PaK40’s. Here’s what was waiting for me. The round edges of the single miniatures’ bases are clearly visible. Also, the bases are very high creating unwanted elevation differences. The platoon at this point. What was wrong with the miniatures, then? A lot, to be honest. To begin with, the miniatures weren’t cleanded properly, so there was still alot of flash on them. They were also placed on the bases in very basic formations ignoring any thought on whether they look good together or not. Also, clearly visible were the metal bases of the single miniatures. I had apparently tried to mask them with acrylic paste earlier, but the result was far from satisfactory. The major failure was, however, the utterly wrong uniform colors. The base color was very much off the target and the camo spots were somewhat horrible. I began the work by fixing the bases. 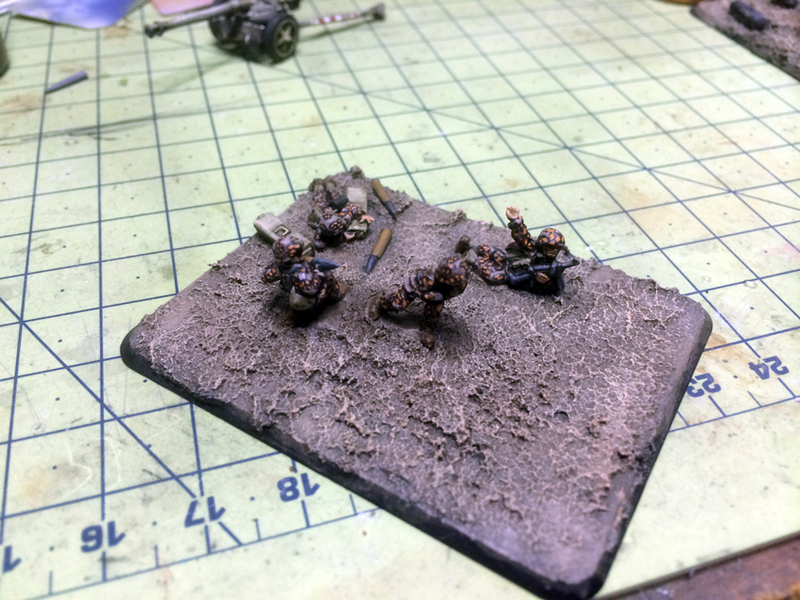 The miniatures were blended in with the bases by adding Grey Pumice around the soldiers. After the bases it was time to paint the soldiers themselves. I began by changing the overall tone of the uniforms to brown by adding a very liberal coating of dark reddish brown acrylic wash on them. I used Agrax Earthshade from Games Workshop, applied straight out of the bottle. To really ensure the tonal change, I applied an additional layer of the wash. Then I reworked the camo pattern by adding lots of irregularly shaped “blobs” on the uniforms using German Camo Black Brown by Vallejo. The dark brown should cover about 40% of the uniform surface. On the dark brown areas I painted small dots of Vallejo’s Light Brown. While this isn’t 100% accurate representation of the historical fall/winter SS-camo, the illusion is very good from the viewing/gaming distance. After the camo was done, I painted the rest of the troopers’ gear. A basic paint-job is all that is needed. Painting the guns themself was very straightforward, as I decided not to paint camo on them. The 1/100 guns are so small, that any camo will look very messy on them. Also, the idea was to salvage this company and paint it to a gaming standard, and I thought a simple but neat paint-job will do. I airbrushed the guns with AK’s dunkelgelb modulation colors. Then -for a reason that remains unclear to me- I proceeded to grossly overchip them. A lesson learned there: never overdo the chipping! A quick pin wash with AK’s enamel Wash for Dark Yellow was applied to the guns and then they were glued to the bases using epoxy glue. Even on a small model the modulation effects work surprisingly well. The chipping is way too visible on this PaK40’s gun shield. The platoon was starting to look quite nice at this point. I chose to add some autumny Silflor tufts on the bases to create an atmosphere of a rural environment. At this point the platoon could have been called ready, as to my experience this is the standard to which Flames of War gamers usually paint their armies to. In all honesty, this standard is very adequate, as the miniatures look really good on the gaming table at this point and the games become nice visual experiences. It doesn’t take too many tufts to make a base look really good. I attach the tufts using PVA glue. At this point I got a little idea. As I had already taken out the infantry platoons of the same company and discovered that they are indeed very boringly based, I wanded to try a very simple trick to try and enhance the army’s look vastly. It was time to plant some trees. I decided to craft the trees myself using a method taught to me by Grandmaster Oakleaf himself. Adding the trees really boost realism and is very easy to do! Self-crafted trees are easy to make and look better than factory -made ones. Finally, I decided to add some camo net over the guns. While this probably is a little bit too much, as there is a lot going on on these bases already, I wanted to experiment with the nets and so went ahead anyway. The camo net is a nice touch, though it does it’s job a little too well by camouflaging the gun on the base! The trees don’t obstruct the view too much from the gamer’s perspective. Here’s the salvaged platoon in all it’s glory! I believe the mission was accomplished, at least with this platoon. It was a satisfyingly fast task to paint this platoon and I’m definately looking forward to completing the rest of the company. I’ll be posting more pics of my progress soonish. Great looking figures, especially for models that are only just a “reasonable” standard… but it’s a bit of a tease telling us the trees are easy to make then not telling us how! ;P Would you mind sharing the process? Great looking figures, especially for just a “reasonable” standard… but it’s a bit of a tease to tell us how easy it is to make the trees then not tell us how! ;P Would you mind sharing the process? I’ll be adding more units to the company as they get finished. Indeed, it’s very satisfying to give new life to old minis.